In addition to criminal cases, our law firm offers counsel for personal injuries and catastrophic accidents, including workers' compensation cases. Our attorneys are familiar with scenarios including motor vehicle accidents, animal bites and wrongful deaths. We also deliver representation specific to medical malpractice. People come to us for help after cancer misdiagnoses, birth injuries, surgical errors, prescription errors and other medical negligence. Our attorneys do everything in their power to pursue fair compensation for clients' pain and suffering. Our law firm also handles family law matters and commercial litigation. We represent both English- and Spanish-speaking clients. 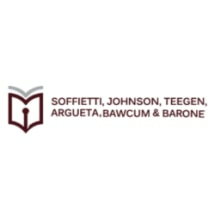 Soffietti, Johnson, Teegen, Argueta & Bawcum, LTD, accepts credit cards as a valid form of payment. We take cases across Lake and McHenry counties.